Carpet and paint being done. Can choose colors w/accepted contract by Jan. 30th, 2019. This home is in area that qualifies for rural housing. Pool membership and additional amenities available through Fox Run Country Club. Acreage, horses and golf in one convenient location. Less than 5 minutes from downtown Simpsonville located near Fox Run Country Club. 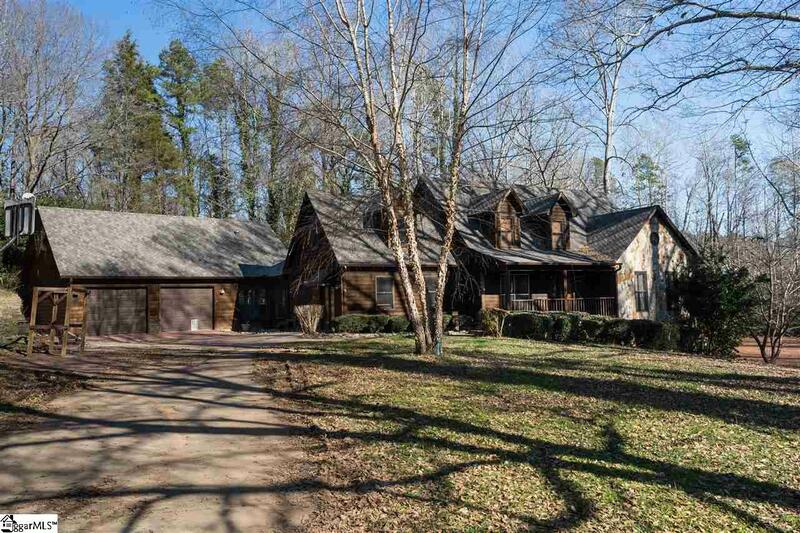 Custom built stone and cedar home is on 2.73 wooded acres. This includes a, 1/2 acre pond and one barn giving you space for a workshop in addition to horses. The acreage has been certified by the National Wildlife Federation as a natural habitat. Upper and lower decks, gazebo and sun room which includes a see-through fireplace and a second kitchen with a gas grill. Hardwoods throughout main level, built-ins, office/studio, updated kitchen w/ solid surface countertops and stainless steel appliances, large bedrooms, tons of storage, a large loft style bonus room with a wet bar. Main level master with jetted tub.